عاملی, علیرضا, یوسف دوست, سعید, باباگلی, رضوان. (1396). بررسی مشخصات مخلوطهای آسفالتی ساخته شده با استفاده از تکنولوژی کف قیر. پژوهشنامه حمل و نقل, 14(2), 321-334. علیرضا عاملی; سعید یوسف دوست; رضوان باباگلی. "بررسی مشخصات مخلوطهای آسفالتی ساخته شده با استفاده از تکنولوژی کف قیر". پژوهشنامه حمل و نقل, 14, 2, 1396, 321-334. عاملی, علیرضا, یوسف دوست, سعید, باباگلی, رضوان. (1396). 'بررسی مشخصات مخلوطهای آسفالتی ساخته شده با استفاده از تکنولوژی کف قیر', پژوهشنامه حمل و نقل, 14(2), pp. 321-334. 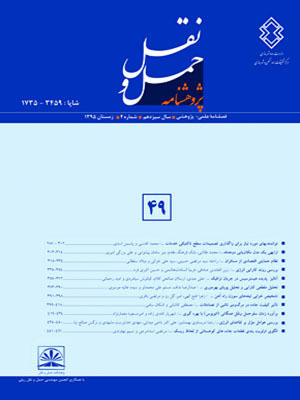 عاملی, علیرضا, یوسف دوست, سعید, باباگلی, رضوان. بررسی مشخصات مخلوطهای آسفالتی ساخته شده با استفاده از تکنولوژی کف قیر. پژوهشنامه حمل و نقل, 1396; 14(2): 321-334. در این تحقیق خصوصیات عملکردی مخلوطهای آسفالتی ساخته شده با کف قیر، مورد بررسی و آنالیز قرار گرفت. در این تحقیق، با انجام آزمایشهای لازم برروی 90 نمونه ساخته شده، تأثیر میزان درصد قیر، نوع و میزان تراکم، دما و نوع عمل آوری برروی مدول برجهندگی و دانسیته نمونه ها مورد بررسی قرار گرفت. از تراکم مارشال و تراکم ژیراتوری جهت ساخت نمونه‌های آزمایشگاهی استفاده شد.با توجه به نتایج بدست آمده، مقادیر مدول برجهندگی نمونه‌های متراکم شده با تراکم مارشال بیشتر از مقادیر مربوط به تراکم ژیراتوری بود. همچنین میزان قیر بهینه نمونه های متراکم شده با تراکم مارشال متناظر با بیشینه دانسیته آنان بدست آمد. در بررسی تأثیر درصد قیر، مشاهده شد که حساسیت نمونه های متراکم شده با تراکم ژیراتوری نسبت به تغییرات درصد قیر، کمتر از نمونه­های متراکم شده با تراکم مارشال است. همچنین در نمونه­های عمل آوری نشده، مدول برجهندگی نمونه­های متراکم شده بوسیله روشهای تراکمی که انرژی بیشتری اعمال می کنند (75 ضربه مارشال و ژیراتوری) کمتر از نمونه های متراکم شده توسط تراکم مارشال با 50 ضربه بود. از طرف دیگر در نمونه های خشک عمل آوری شده، اگرچه نمونه‌های متراکم شده با ژیراتوری نسبت به تراکم مارشال، وزن مخصوص بالاتری داشتند، اما مشاهده شد که نمونه‌های متراکم شده توسط تراکم مارشال، مقادیر مدول برجهندگی بالاتری در مقایسه با تراکم ژیراتوری از خود نشان دادند. به علاوه در نمونه های عمل آوری اشباع مشاهده شد که نمونه‌های متراکم شده با تراکم ژیراتوری در درصد قیر بالاتر مدول برجهندگی بیشتری از خود نشان دادند. درنهایت بعلت درصد قیر نسبتاً کم مخلوط‌های آسفالتی ساخته شده با کف قیر، تغییرات دما در مقایسه با مخلوطهای آسفالتی گرم، تأثیر کمتری بر روی مدول برجهندگی آنان گذاشت. 1Department of Civil Engineering, Malard Branch, Islamic Azad University, Malard, Tehran, Iran. In this paper an attempt is made to evaluate the engineering characteristics of asphalt mixtures made ​​with the foam bitumen. In this study, several tests were conducted on 90 samples to evaluate the effect of bitumen content, type of compaction, temperature and curing time on resilient modulus and density of the samples. Marshall and Gyratory compaction method was used to prepare laboratory specimens. According to the results, the ​​ resilient modulus values of mixtures compacted with Marshall Method has a higher density than mixtures compacted with gyratory compactor. The optimum bitumen content of mixtures compacted with Marshall Method are determined corresponding to the maximum density of the samples. To evaluate the Effect of bitumen, it was found that the sensitivity of mixtures prepared with Marshall Method to changes bitumen content is lower than Gyratory compacted samples. In Samples with no curing, resilient modulus of compacted samples by applying higher compacting energy (75 blows Marshall and Gyratory) is lower than mixtures compacted with 50 blow of Marshall. On the other hand, on samples curing in dry condition although the gyratory samples have higher density compare to marshall samples, but it was observed that the samples compacted by the Marshall compactor have higher resilient modulus. In addition in samples curing in wet condition, gyratory samples have higher resilient modulus in higher percentage of bitumen. Finally, due to the relatively low percentage of bitumen in asphalt mixtures made ​​with the foam bitumen, temperature changes in comparison with hot asphalt mixtures have lower effect on the resilient modulus. یوسف دوست، س.، (1386)، "بررسی آزمایشگاهی مدول برجهندگی و مقاومت کششی غیر مستقیم آسفالت کف قیری"، پایان­نامه کارشناسی ارشد. دانشکده مهندسی عمران، پردیس دانشکده های فنی، دانشگاه تهران. -"مشخصات فنی اجرائی بازیافت سرد آسفالت" (1386)، نشریه 339، سازمان مدیریت و برنامه ریزی کشور. - An Overview of Recycling and Reclamation Methods for Asphalt Pavement Rehabilitation, Asphalt Recycling and Reclaiming Association, Annapolis, MD, )1992(. - Bissada, A.F. (1987), “Structural Response of Foamed-Asphalt-Sand Mixtures in Hot Environments”. In Transportation Research Record 1115, TRB, National Research Council, Washington, D.C., pp. 134-149. - Bowering, R.H.(1970), “Properties and Behaviour of Foamed Bitumen Mixtures for Road Building”. 5th ARRB Conference, Part 6, pp. 38-57. - Castedo, L.H. and Wood, L.E. (1983), “Stabilization with Foamed Asphalt of Aggregates Commonly Used in Low-Volume Roads”. In Transportation Research Record 898, TRB, National Research Council, Washington, D.C.
- Csanyi, L.H.(1957). “Foamed Asphalt in Bituminous Pavements”, Transportation Research Record 160, TRB, National Research Council, Washington, D.C., pp. 109-122. - Chiu, Chui-Te, and Huang, M. Y., (2002). “A study on properties of foamed asphalt treated mixes” Proc., 82nd Annual Transportation Research Board Meeting (CD-Rom), Transportation Research Council, Washington, D.C.
-Chandra, R., Veeraragavan, A., & Krishnan, J. M. (2013). “Evaluation of Mix Design Methods for Reclaimed Asphalt Pavement Mixes with Foamed Bitumen”. Procedia-Social and Behavioral Sciences, 104, pp. 2-11. -Design, P. (1992). “A Guide to the Structural Design of Road Pavements”. Austroads Publication No. APGP17/04. Austroads, Sydney. -Du, S. (2014). “Interaction mechanism of cement and asphalt emulsion in asphalt emulsion mixtures”. Materials and structures, 47(7), pp. 1149-1159. -García, A., Lura, P., Partl, M. N., & Jerjen, I. (2013), “Influence of cement content and environmental humidity on asphalt emulsion and cement composites performance”. Materials and structures, 46(8), pp: 1275-1289. - “Guidelines for Cold In-Place Recycling Asphalt Recycling and Reclaiming Association”, Annapolis, MD, (1992). - He, G. P., & Wong, W. G. (2007), “Laboratory study on permanent deformation of foamed asphalt mix incorporating reclaimed asphalt pavement materials”. Construction and Building Materials, 21(8), pp. 1809-1819. - He, G. P., & Wong, W. G. (2008), “Effects of moisture on strength and permanent deformation of foamed asphalt mix incorporating RAP materials. Construction and Building Materials”, 22(1), pp. 30-40. -Iwański, M., Chomicz-Kowalska, A., (2012). “Experimental study of water and Frost resistance of foamed bitumen mixes in the cold recycling technology”, 5th Eurasphalt & Eurobitume Congress, 13-15th, Istanbul, Turkey. “the effects of using foamed bitumen and bitumen emulsion in the cold recycling technology”. In 8th International Conference, Environmental Engineering. - Kandhal P.S. (1984), “Asphalt Cold Recycling Technology in Pennsylvania, AAPT Proceedings”, Vol. 53, Association of Asphalt Paving Technologists, Minneapolis, MN. - Kavussi, A., & Modarres, A. (2010), “Laboratory fatigue models for recycled mixes with bitumen emulsion and cement”. Construction and Building Materials, 24(10), pp. 1920-1927. -Kavussi, A., & Modarres, A. (2010), “a model for resilient modulus determination of recycled mixes with bitumen emulsion and cement from ITS testing results”. Construction and Building Materials, 24(11), pp. 2252-2259. - Kendal M., Baker B., Evans P & Rammujan J., (1999), “Foamed Bitumen Stabilization”, Southern Region Symposium, Australia. -Khosravifar, S., Schwartz, C. W., & Goulias, D. G. (2013), “Foamed asphalt stabilized base: a case study”. In Proceeding of ASCE airfield and highway pavements conference. pp. 106-117. -Kim, Y., & Lee, H. D. (2012), “Performance evaluation of cold in-place recycling mixtures using emulsified asphalt based on dynamic modulus”, flow number, flow time, and raveling loss. KSCE Journal of Civil Engineering, 16(4), pp. 586-593. -Kim, Y., Im, S., & Lee, H. D. (2010), “Impacts of curing time and moisture content on engineering properties of cold in-place recycling mixtures using foamed or emulsified asphalt”. Journal of Materials in Civil Engineering, 23(5), pp. 542-553. - Kim, Y., Lee, H. D., & Heitzman, M. (2009), Dynamic modulus and repeated load tests of cold in-place recycling mixtures using foamed asphalt. Journal of Materials in Civil Engineering, 21(6), pp. 279-285. -Kim, Y., & Lee, H. D. (2011), Influence of reclaimed asphalt pavement temperature on mix design process of cold in-place recycling using foamed asphalt. Journal of Materials in Civil Engineering, 23(7), pp. 961-968. -Kuna, K., Airey, G., & Thom, N. (2016), “Development of a tool to assess in-situ curing of Foamed Bitumen Mixtures”. Construction and Building Materials, 124, 55-68. Kuna, K., Airey, G., & Thom, N. (2016), “Mix design considerations of foamed bitumen mixtures with reclaimed asphalt pavement material”. International Journal of Pavement Engineering, pp.1-14. -Long, F. M., Theyse, H. L., & Ventura, D. F. C. (2004), “Characterisation of Foamed Bitumen Treated Material from HVS Test Section”. Transportek, CSIR, South Africa. - Maccarrone, S., Holleran, G. and Leonard, D.J. and Hey, S. (1994), “Pavement Recycling Using Foamed Bitumen”. 17 the ARRB Conference, Part 3, pp. 349 - 366. - Manual, W. C. R. (2004), Wirtgen GmbH. Windhagen, Germany. -Modarres, A., Nejad, F. M., Kavussi, A., Hassani, A., & Shabanzadeh, E. (2011), “a parametric study on the laboratory fatigue characteristics of recycled mixes”. Construction and Building Materials, 25(4), pp. 2085-2093. - MunthenK.M., (1999), “Foamed Asphalt Mixes – Mix Design Procedure”. Contract Report CR-98/077, CSIR Transportek, South Africa. -Nazemi, M., & Heidaripanah, A. (2016), “Support vector machine to predict the indirect tensile strength of foamed bitumen-stabilized base course materials”. Road Materials and Pavement Design, 17(3), pp.768-778. -Rutherford, T., Wang, Z., Shu, X., Huang, B., & Clarke, D. (2014), “Laboratory investigation into mechanical properties of cement emulsified asphalt mortar”. Construction and Building Materials, 65, pp. 76-83. -Yan, J., Zhang, Z., Charmot, S., Ding, W., & Li, F. (2014), “Investigation and Prediction Model for the Dynamic Modulus of Asphalt Emulsion Cold Recycled Mixtures”. Journal of Materials in Civil Engineering, 27(1). - Wood, L. E., White, T. D., & Nelson, T. B. (1988), "Current practice of cold in-place recycling of asphalt pavements. Transportation Research Record", (1178). -Wirtgen Group, (2002), “Rehabilitation of a Heavily Trafficked Road, Pavement Investigation and Construction Report”, Germany.